It received second prize in the California Watchable Wildlife's January/February 2012 Photo Competition and featured in March/April 2012 issue of Outdoor California magazine. It was part of a 2013 California Watchable Wildlife exhibit at The Arts Gallery, in Auburn, California. It was also on display at Filoli in Woodside, California in their "Handcrafted & Through the Lens: Nature Interpreted Exhibit" in 2012. 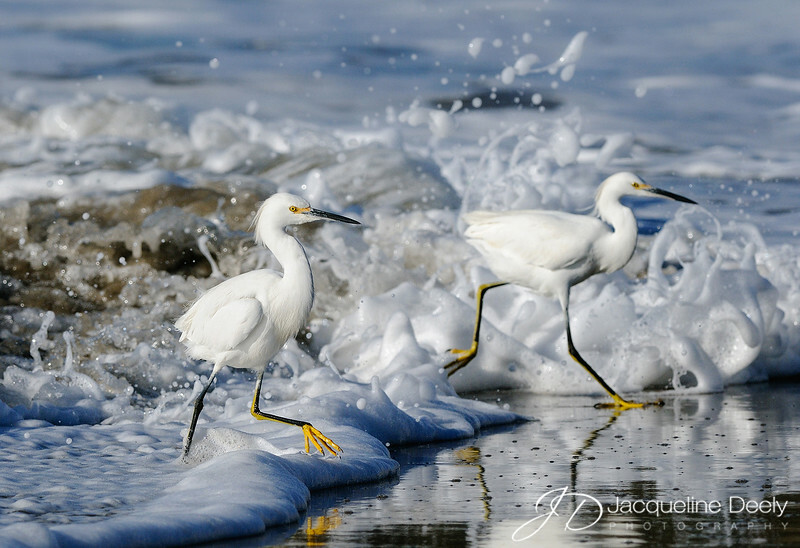 I love snowy egrets and Natural Bridges State Beach in Santa Cruz is a haven for these energetic birds. Their behavior and comical antics makes them wonderful subjects to photograph. Among the most elegant of the herons, the slender snowy egret sets off immaculate while plumage with black legs and brilliant yellow feet. Those feet seem to play a role in stirring up or herding small aquatic animals including fish, frogs, worms, crustaceans and insects as the egret forages. On this particular winter’s morning, a storm was brewing, so the surf was definitely up. Large waves were rolling in, as this pair of athletes faced the challenge by dashing out into the impending danger as the tide retreated; plucking crustaceans out of the sand and dashing back before the waves came crashing down. Once the victim of aggressive plume hunting for the fashion industry, snowy egrets have been protected in north America since 1918 under the Migratory Bird Treaty Act. This legislation prohibited the hunting of egrets for their plumes, and helped them regain their former levels of abundance. Snowy egrets today may be threatened by chemical contamination and oil spills, yet their biggest continuing threat is habitat loss: more than 100 million acres of wetlands in the U.S. have been drained since colonial times (when total wetland area was estimated at 127 million acres). Love the colors and the contrast, perfect!